If your kitchen is out-dated, deteriorating, or simply doesn’t fit the desired aesthetic for your home, you may want to consider a custom kitchen remodel. Upgrading with a remodel is a great way to improve everyday living and boost the value of your home. Kitchens are often one of the top make-or-break elements when trying to sell your home, and a beautiful kitchen with high quality countertops can go a long way toward increasing the value of your home or closing the sale. 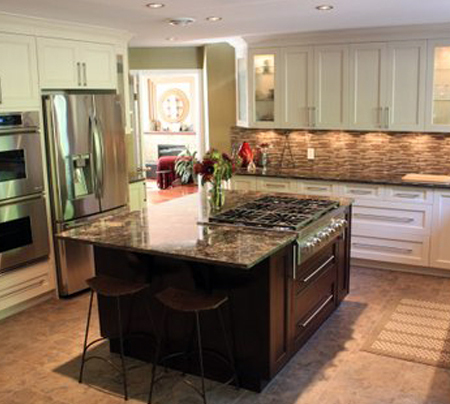 At Custom Craft Cabinets & Millwork in Burnaby, BC, we specialize in custom kitchen renovations, helping you build the kitchen of your dreams at an affordable price. From custom cabinetry work to high quality countertop installation, our team has the attention to detail and quality craftsmanship needed to deliver a beautiful, custom kitchen that’s built to last. Prefinished birch boxes: We manufacture our boxes in-house, providing high quality, reliable cabinetry boxes that are designed to fit perfectly in your space. BLUM integrated soft close drawer slides and hinges: This drawer and cabinet hardware system is the perfect solution to slamming drawers and cabinets. If you have a tendency to overzealously close drawers, this hardware helps catch it on the way in, slowing down the drawer or door and preventing it from slamming. Quality doors: We offer all styles of doors, from high-gloss slab to decorative wood, to build a cabinetry system that suits your design style. Reliable drawers: We offer standard, metal and dovetail drawers. All drawers are supplied with soft closing slides and a lifetime warranty on the hardware. 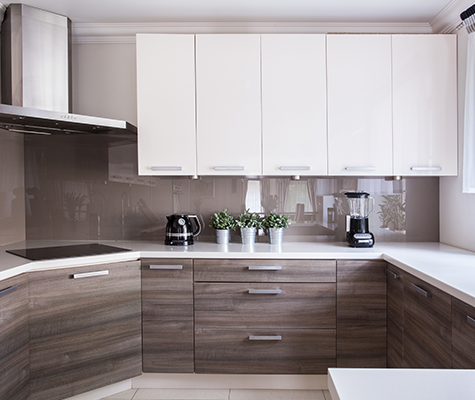 Our design team will work with you to understand the shortcomings of your current kitchen cabinets and the desired function of your new cabinets. Once you choose a design, we’ll get to work crafting beautiful, durable cabinets that will last for years. Anyone is welcome in our cabinet shop at any time to inspect the construction of our boxes and parts. Quartz: Made of ground quartz and a small amount of resin, this countertop material is great for providing a look similar to granite with better stain resistance and less maintenance. Stone: Natural stone countertops provide exceptional natural beauty for any kitchen. Soapstone, limestone, and marble are some of the popular natural stone choices. Laminate: Typically the most affordable countertop option, laminate countertops are easy to clean and maintain, resisting stains and water damage. Granite: Granite is one of the most popular kitchen countertop choices. It holds up extremely well under heat and scratching, plus it’s stunning in any kitchen. Call us today at (604) 435 2422 to learn more!